for beginning to advanced artists. Workshops in ceramics, fiber arts, fine art, jewelry/metal arts and sculpture are led by outstanding local and national instructors. The workshops attract visitors from across the country, as well as internationally, who enjoy the retreat-like setting far from the hustle and bustle of city life. Mendocino Art Center campus is just a short stroll to cafes, restaurants, shops, and the Headlands State Park overlooking the ocean. At the height of the logging boom, Mendocino City, as it was called, was the center of Big River Township, which included Albion, Caspar, Little River, and Navarro. The population of the city was around 2,0002, with six hotels and nine saloons. After the Mendocino mill closed in 1938, the population dwindled to about 500 in 1958. A sea change began in 1957 when artist-teacher Bill Zacha put $50 down on the Albert Brown House on Little Lake Street. He soon found a job at the high school, and in August 1958, with his wife Jennie and their daughter Lucia, moved to Mendocino with plans to start an art colony. Within a year, he founded the Mendocino Art Center a block west of his house at the site of the burnt-out Preston mansion where East of Eden was filmed. Only three artists lived in town then: Zacha and new arrivals Byron Randall and his wife Emmy Lou Packard. The county was ripe for Zacha’s plans. Visitors appreciated its beauty and remoteness. Many Bay Area residents enjoyed camping; some had vacation cabins. Hollywood sought filming locations in the village and nearby. But with its traditional businesses in decline, the county was classified as a depressed area. The first organizations to which Zacha presented his plans were the inland and coastal chapters of Mendocino County Art Association, founded in 1954. The Ukiah Daily Journal reported on the inland meeting: “Art colony to be set up in Mendocino in the Fall” (6/5/59). MCAA members and many local residents volunteered for work parties, and later attended classes. The vital contribution of locals to the Art Center is seldom emphasized. Long-established families and businesses donated funds and materials. Evelyn Larkin, wife of the superintendent of schools, was on the Art Center’s first Board. At its largest in 1963, the 33-member Board of Governors (how did they get anything done?) included several San Franciscans, but most were residents from Gualala to Fort Bragg. The Art Center’s impact was immediate. The population surged to 1,165 by 1962 when Look magazine declared it a “miracle” that the town was vibrant again. As Zacha said “the townspeople have regained their spirit and pride in living here.”3 In the first four years, new businesses sprouted, including galleries, shops, and restaurants – one of them doubling as a theater, an inn, and a motel. Between 1959 and 1971, an ever-changing cast of volunteers built the Art Center. Funds came from several philanthropists, a few strategic loans, and $5 donations. For the next decade, the population ballooned with people moving to Mendocino because of the Art Center. In 1970, the New York Times characterized Mendocino as an art colony “Where Squares, Longhairs Mix;” “bridging the generation gap,” because “people of all age groups and income levels are attracted by the preservation of Victorian architecture, the rugged coastline. Once again the artist community has come together to donate to the Mendocino Art Center. With a vision to complete a jewel representing the grounds of Mendocino the “Poppy Project” bloomed. The matilija poppy is a regular on campus. Plants standing 4-5 feet tall with flowers a good 5 inches in diameter have inspired artist visiting time and time again. In the late summer of 2015 over a morning breakfast, board member John Cornacchia, jewelry studio director Nancy Gardner, jewelry artist Tom Herman decided they also had an idea to celebrate life, in the center for the arts. And the “Poppy Project” came to be. Tom Herman and Patsy Croft had worked together before researching the 1900’s influence of enameling in the US on the Ada Brooch. http://alohilanidesigns.com/the-ada-brooch/ With the inspiration to create in their bones they were invited to the Center to teach workshops on techniques of fabricating, chasing, saw piercing and enameling to give students a closer look of how a jewel of this statue is made. And have a first hand look of the beginning of Tom and Patsy’s collaborate in making the jewel “Matilija Poppy Brooch”. With the help of fellow artist coming together, in a stormy Jan of 2017, Ethan Herman, Diana Casaba, Nancy Gardner, Bob Weinstock, and John Cornacchia, lent hands to help Tom and Patsy to create this beautiful jewel of 18k gold and fine enamels. Aprox. 3” x 5” After spending 2017 in Tom’s studio and 2018 in Patsy’s studio the Matilija Poppy Brooch is now on it’s way to NY to capture public attention. Great news. 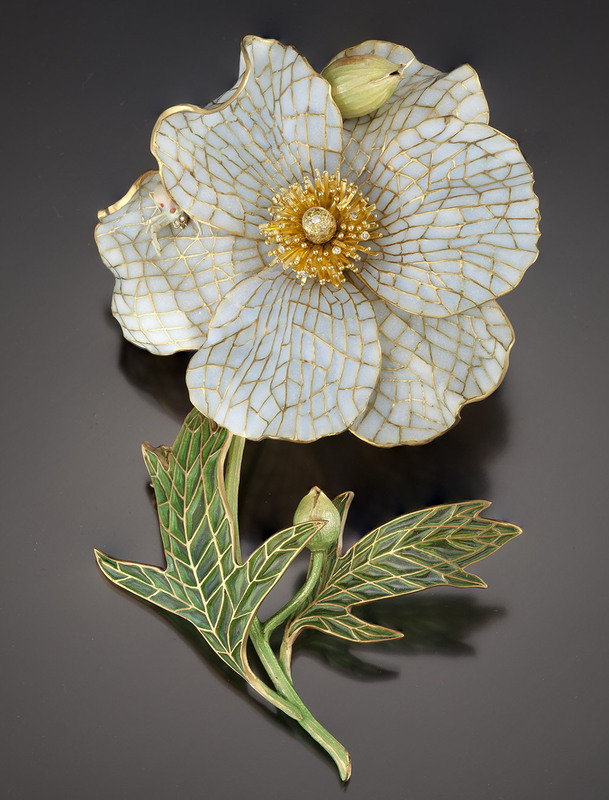 Sotheby’s plans to auction the Matilija Poppy Brooch April 2019. Look for the Majestic Jewels Auction April 17 2019. Check out our day by day work to appreciate what goes into a project like this!